There is something invidious, even shameful, about the Western response to the on-going struggle in Egypt for freedom and democracy. For more than two weeks now, the people of Egypt have taken to the streets to demand freedom and an end to decades of tyranny. They have been shot at, beaten, bullied and jailed, yet they keep going, their numbers swelling with each new attempt to silence them or break their will. They are seeking the same basic rights that the West has always insisted is the birth right of every human being. This is the breakthrough that we have been waiting for, the response to radical Islam that we did not dare to believe would come. We should be pleased that the people are not calling for a jihad against the West. We should be thrilled that democracy and freedom is energizing and mobilizing the Arab street in a way that Osama bin Laden was never able to do. Yet, in this pivotal moment of history, the West is dithering, choosing the safety of the status quo in the guise of “stability” over genuine freedom and democracy. When the brave people of Poland, the former Czechoslovakia, and other Eastern European nations rose up against their communist rulers in 1989, we cheered them on and rushed to support them. When the Berlin Wall fell that same year, we shared the giddy excitement that Germans felt. When Burmese monks led the people in defying their military rulers in 2007, we encouraged them and insisted that the military must go. When Iran’s rulers launched a bloody crackdown on peaceful demonstrators following the fraudulent 2009 presidential elections, we reacted with outrage and demanded that those responsible be severely sanctioned. There was no talk of transition then. There was no turning to tyrants and despots to oversee the move towards a democratic future. There was no suggestion that somehow the people pressing for change with their very lives were not ready or worthy for freedom and democracy. We understood that the transitions, after years of tyranny, could well be messy affairs. We expected that mistakes would be made. Democracy is, after all, a work in constant progress. But we believed that freedom would prevail, that democracy was an unstoppable force. Sadly, this confidence and faith in the power of democracy appears to be faltering at what may well be its greatest moment. Instead of cheering on the peaceful protestors in Egypt and letting them know without equivocation that all free and democratic nations stand with them, that their struggle for freedom and human dignity is sacred to us, we are dancing with their oppressors and entrusting the transition to democracy to the very people who disdain it. Vice-President Omar Suleiman, for example, the former head of the Mukhabarat, the dreaded secret police, whom Western governments now appear to have anointed to lead Egypt’s transition to a supposedly democratic future, has already stated that the Egyptian people are not ready for democracy, and that it is too early to lift the hated emergency laws that have been used to deprive Egyptians of their rights. The people of Egypt have rejected him and so should we. 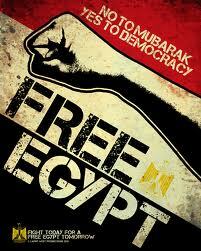 Much has also been made of the threat from the Muslim Brotherhood and the fear that Egypt might become another Iran. While it cannot be ruled out of course, it seems abundantly clear that the people of Egypt are inspired by freedom and democracy rather than radical Islam. They want to prosper and grow. They want to be free to pursue their hopes and aspirations for a better future and they see democracy as the answer. We must not allow the fear of failure or of radical Islam to keep us from supporting them. And neither should we buy into the chimera of their despots that the only way to contain radical Islam is through dictatorship. There is a better way – the way of freedom and democracy – and that is what the people on the streets of Egypt are choosing. Egypt now has a unique opportunity of breaking free of the chains of oppression and despair. The brave people of Egypt, and especially the young men and women who represent the future of that nation, are laying their lives on the line for freedom and democracy. They must not stand alone or wait in vain for the support and encouragement of free people everywhere.